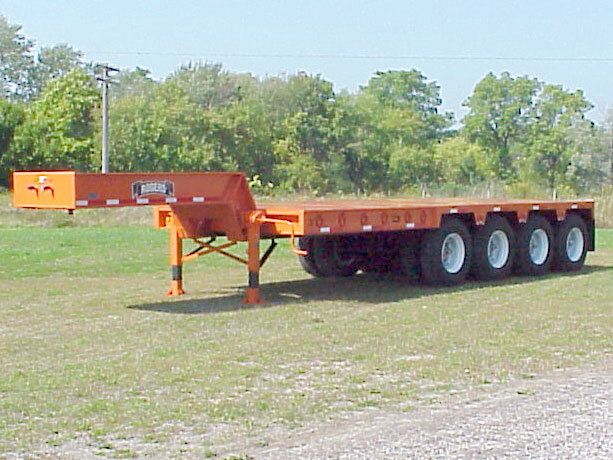 FG100L-4X is a fixed gooseneck trailer built for use in a steel mill. It can handle a 100-ton load with its super heavy-duty 120,000 capacity 4-axle spring/walking beam suspension. Heavy-duty, two-speed landing gear is designed to support the empty trailer. The entire deck is covered with 1/2" steel plate for added durability and is designed to haul the 100-ton load in 10'-0" of its deck.